When I think of summer I think of family BBQs, swimming and hanging out in our backyard these iconic summer moments are what I look the most forward to for our short but sweet Michigan summers. This summer has been so much fun with our new patio and we’ve been spending lots of time together relaxing, BBQing, soaking up the sun and hitting up our local playgrounds. I love to snack outside in the summertime while I relax and play with the kids and one of my favorite snacks is Lay’s BBQ potato chips. This summer Lay’s potato chips is celebrating 75 years as the perfect summer snack. 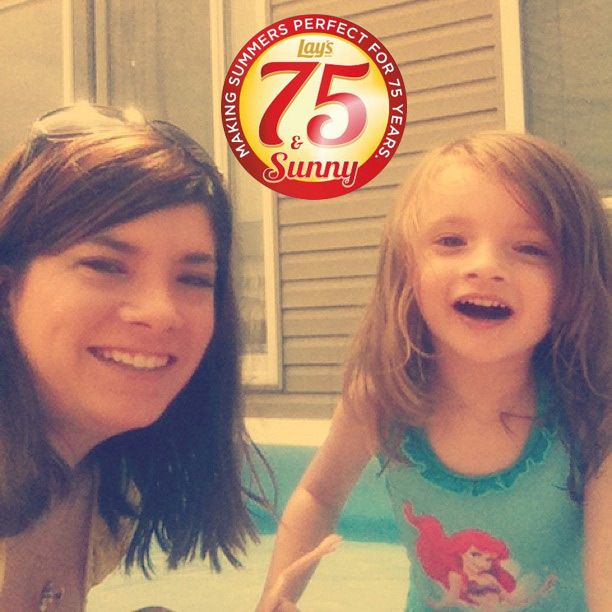 Every day for the 75 days of summer, they have been highlighting favorite summer moments using Lay’s potato chip packaging. Lay’s is asking fans to simply share your favorite summer moment to Twitter and/or Instagram and tag @Lays and use the hashtag #Lays75. This will also enter you for a chance to win a daily $75 gift card! I just shared my iconic summer moment – make sure you do, too! And, for the DIY’er in all of us, simple tutorials on their Pinterest page show all of us how to re-create the Lay’s images at home. How fun, we LOVE Lays! Going to enter now!! Lays are our favorite chips!! Good luck! Hope you win!!! My favorite thing to do is travel, we’ve been traveling a lot this summer even if it’s only short trips to nearby places but we have visited many places and made wonderful memories! Short trips sometimes are the best – shorter drives = more time for fun too!! !